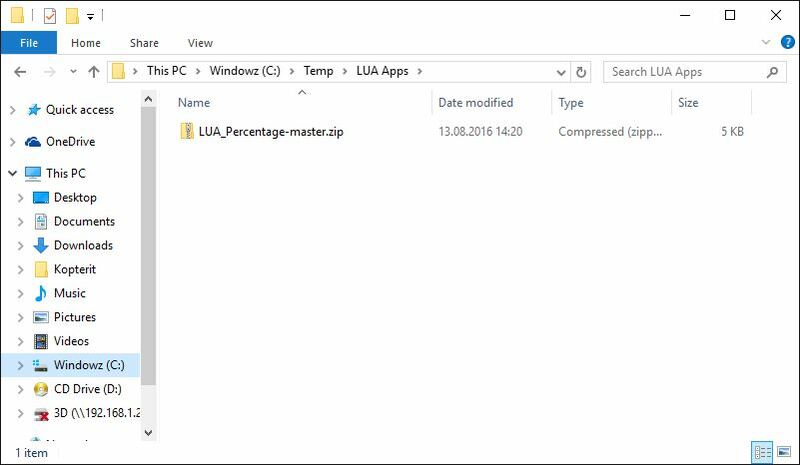 I’ve got a few questions how to get Lua applications installed to transmitter so it is time to answer that with a step by step guide. 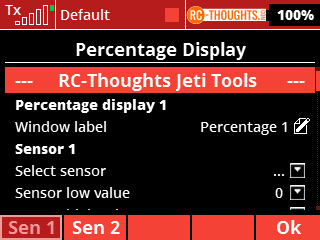 This guide is a support article to RC-Thoughts Jeti Tools found here so I’ll be using the Percentage application as example. Of course! 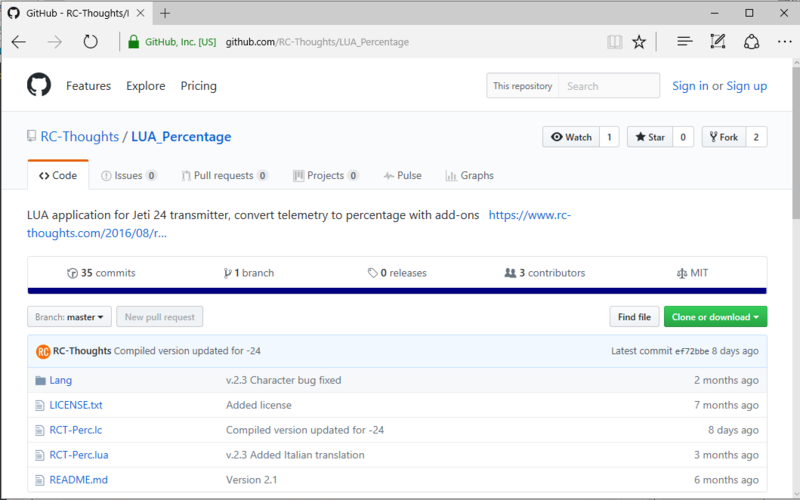 Change, release, share! Some things needs to be taken into consideration, please have a look here. 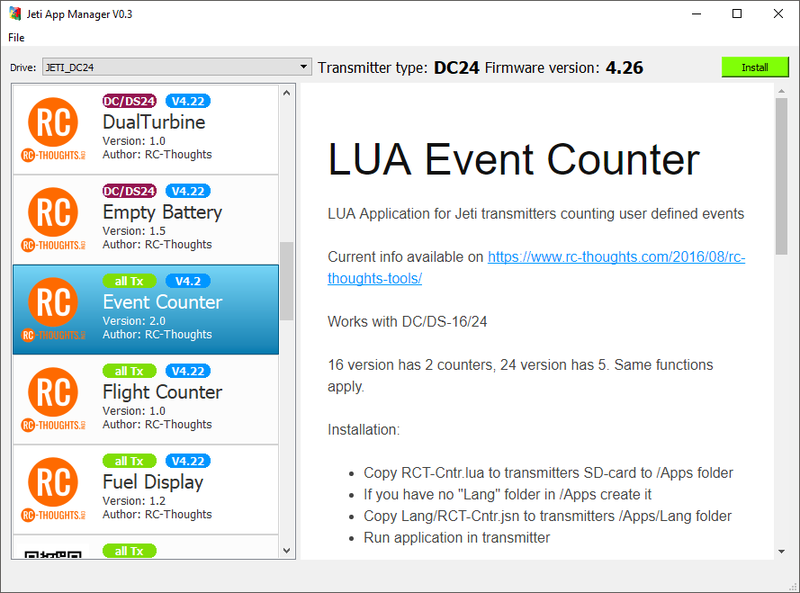 There is an excellent application available for installing lua-apps to your transmitter. 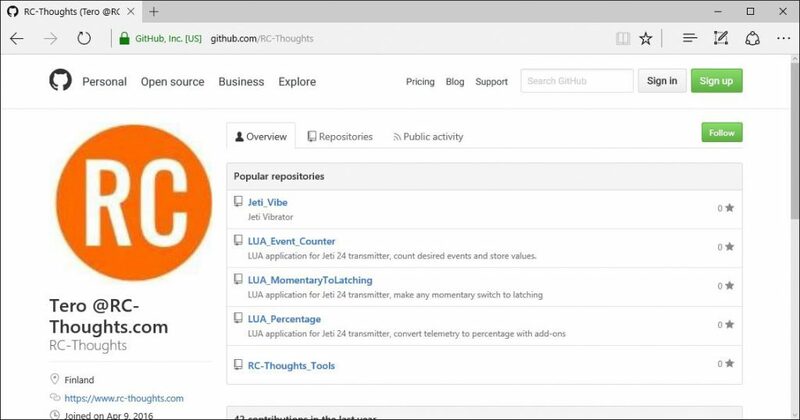 You can find the application for Windows and Mac here. For a short presentation have a look here. 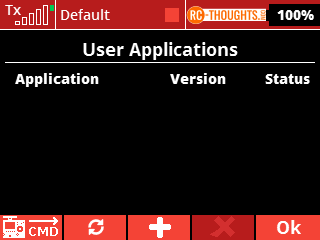 Jeti App Manager is made by M.Lehmann, Germany, it’s not a RC-Thoughts application. 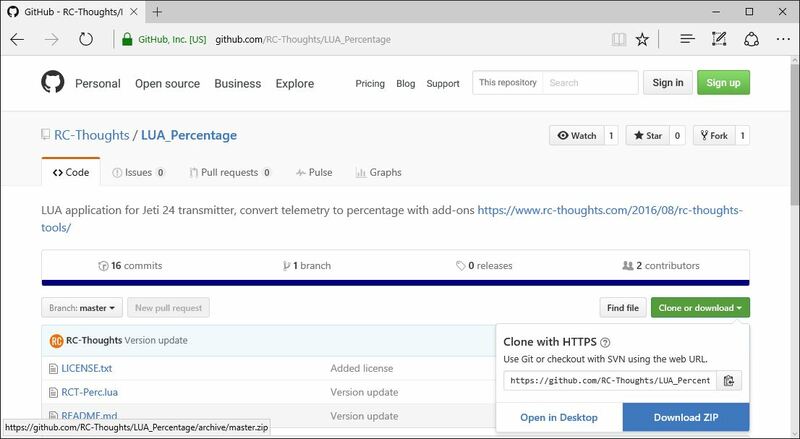 You will see a listing of files included, usually a license on usage permissions, the application file itself (RCT-Perc.lc) and a readme file. Usually my apps have a translation file in Lang-folder too. Source-code (RCT-Perc.lua)is available in the “Source” folder. 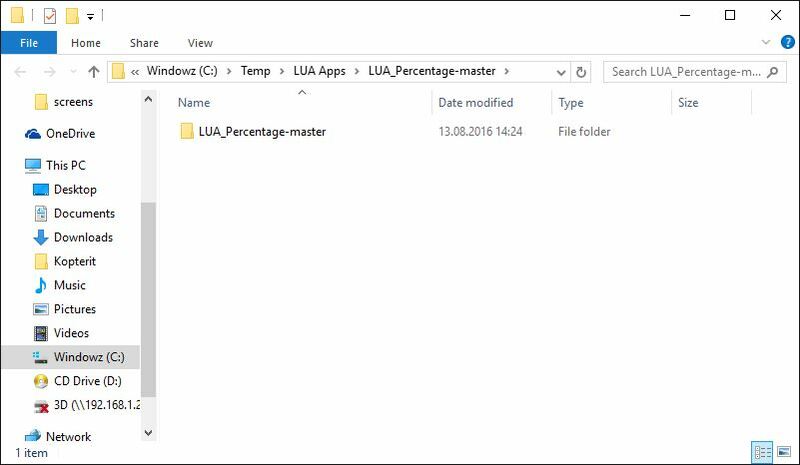 Save the zip-file on your computer and open the folder where you saved it. 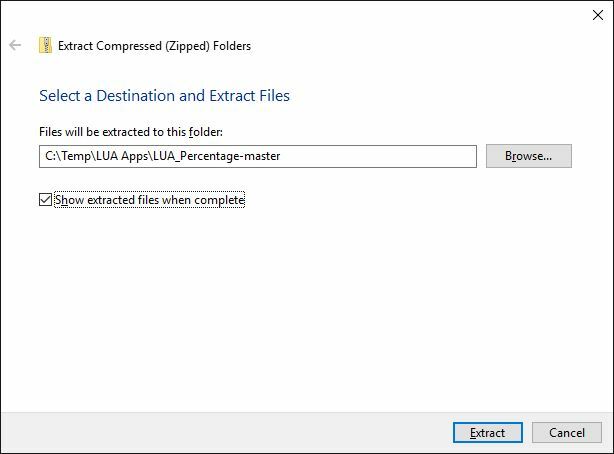 LUA-applications are always equipped with file extension “.lc” or”.lua”. The difference is that -lc is pre-compiled and uses less memory in your transmitter. The .lc-file cannot be read with text-editor but .lua can, so the .lua is the source-code. 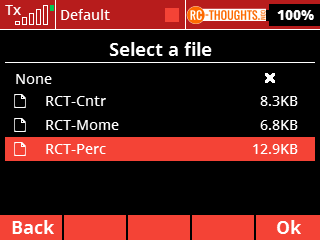 If your computer does not show file extensions you need to know the name of the file, in this case it is “RCT-Perc”. So, right-click on the file and choose “Copy”. NOTE: If there is a folder “Lang” make sure to copy that too or the app won’t work. 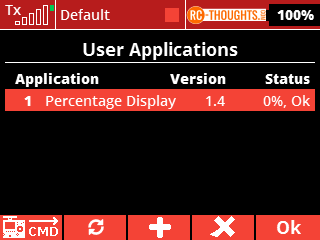 That means the “RCT-Perc.jsn” needs to be in transmitters Apps/Lang folder! Next we need to connect the transmitter to computer to transfer the application to transmitter. 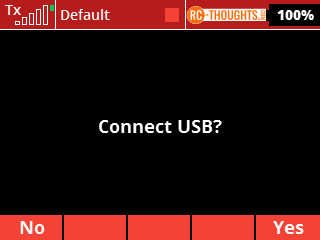 Press yes and you are connected. 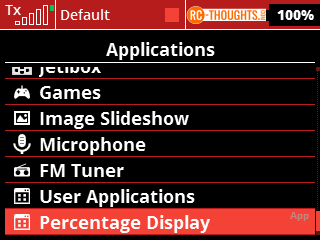 Right click on the empty space in the right side of the window and choose “Paste” and the file “RC-Perc.lc” (or “RCT-Perc.lua”) and any files in Lang-folder are copied to your transmitters “Apps”-folder. In the menu popping up choose “Eject”. This is a safe way to disconnect any external USB-drives from computer. If there is any read or write operations pending they will be done before computer disconnects the drive. 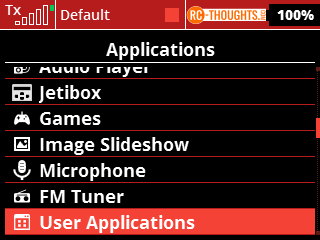 There you go, own applications in Jeti transmitters!